Do you want to promote your Facebook posts to the people in a specific country, region or city? 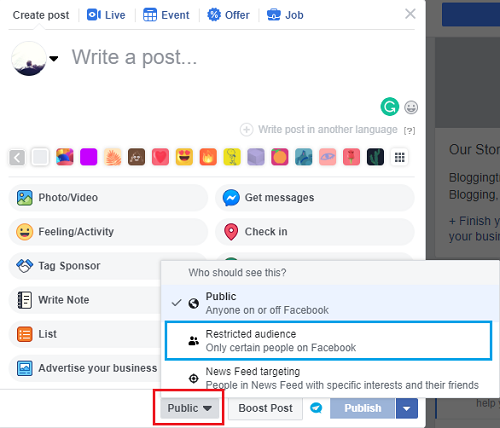 Post targetting is a powerful feature available for all Facebook pages to put their posts in front of the right audience. Its advanced version is available for Facebook ads users with more controls to better optimize the audience for maximum reach and traffic. But now we’ll tell you about a page feature which you can use freely and promote the posts better than before. There is no use of showing your contents to the wrong people. Before creating Facebook posts, refine your audience by their geographical location who are more likely to read, share or comment on them. 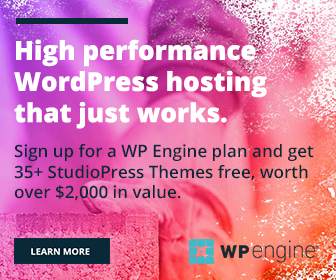 Filtering helps you to improve the user engagements, reach and traffic to the site. Here’s how can you do this. Sign into Facebook and open your page to post the content. Enter your message and link in the text box. Scroll down and click the globe icon to get additional settings. 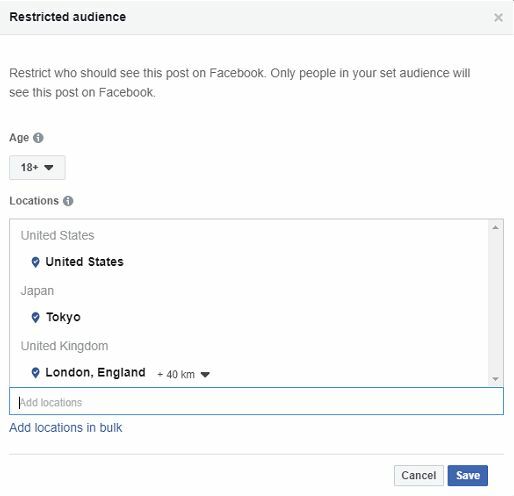 Choose “Restricted Audience” to filter your audience. A box will open with options to restrict the audience by age and location. You can type specific location names in the Locations field. When you start typing, Facebook will suggest a number of places that begin with the text you entered. Choose your desired place and click on Save. Choose the “Add locations in bulk” option to set your target location in bulk. If you decided to add locations in bulk, you should choose a location type as the next. To target the people in a country as a whole, select “Countries” from the drop-down box and type the names of countries one by one. You can also enter city names and postal codes to target audience at a narrow range. Click “Match locations” button when you finished. Now you will come back to the previous screen along with the locations chosen. Check the last place I selected. I target the people within the 40km radius of London city, United Kingdom. The limit can be changed based on your tastes and requirements. 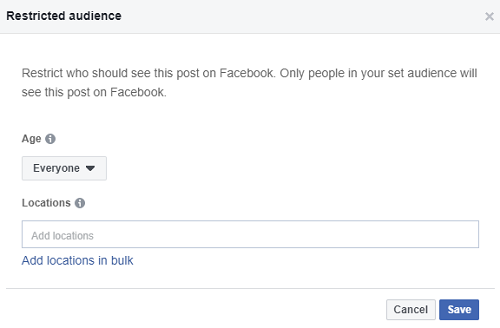 These kinds of radius wise limits are useful if you create posts that exclusively target people in a specific area. Save and your audience filter is successfully applied to the post you are going to publish. Schedule or publish the content as usual.